Once upon a time (and this is a true story even though it begins "once upon a time") there was a physician in India who had amazing ears. His name was Krishan Chopra. He was a cardiologist with the Indian Army. His ears were so sensitive that, through his stethoscope, he could hear and time the milliseconds between parts of a heartbeat that, today, doctors must use an EKG to measure. 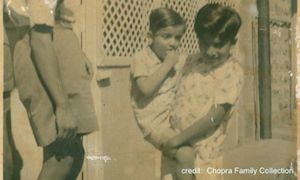 Dr. Chopra had two sons. Deepak was the older. Sanjiv the younger. A doctor's war. The battleground: a hospital. The enemy: SARS. There’s an old quote from Mister Rogers that has been circulating on Facebook since the Boston Marathon bombings.